But the cry of Morgoth in that hour was the greatest and most dreadful cry that was ever heard in the northern wold: the mountains shook, and the earth trembled, and rocks were riven asunder. Deep in forgotten places that cry was heard. Far beneath the halls of Angband, in vaults to which the Valar in the haste of their assault had not descended, the Balrogs lurked still, awaiting ever the return of their lord. Swiftly they arose, and they passed with winged speed over Hithlum, and the came to Lammoth as a tempest of fire. There are other passages in QS that echo this reach into the depths. But I can’t remember them now. I hope I don’t get in trouble for copyright violation with these little snippets. Hopefully this site will get such little traffic that the message will get across to interested parties without causing problems! 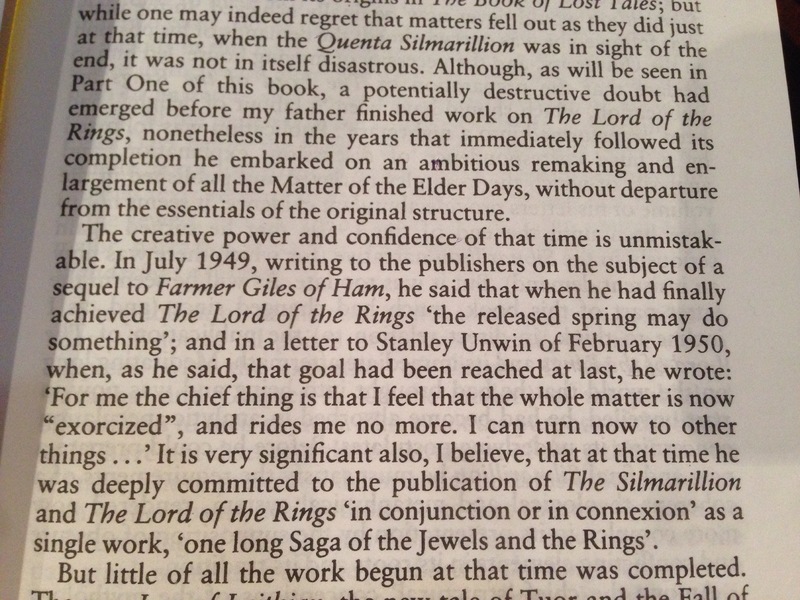 I like this little passage from the forward of The History of Middle Earth part three, where Christopher is pointing out a period of pronounced creativity for his Father, followed by a satisfaction of a job well done having completed a part of his “task”. So what was the task? Why pour hours and weeks and years into such a rich and deep project? Surely there is something in the process that yields more than just a nice story to tell your kids? In the same way, why am I constantly pulled back to reading the majesty of the Valar and tragedy of the elves and mysteries of Men? So far, reading The History seems to give a little more insight into that process. I am interested in Tolkien’s process and purpose of writing as much as the content of his stories. For me, finding the underlying meaning of the images and their effect and applicability in my life is really what it’s all about. Although I confess that reading Tolkien also provides a nice and entertaining break from other psychological reading while retaining plenty of fuel for intuitive analysis. It takes a lot of extra energy to extract answers to those questions from the Tolkiens’ work while Jung and Campbell address them directly. But for some reason Tolkien senior seems to provide the best content for practicing the type of dissection and analysis that can be learned from people like Jung and Campbell. This passage is very similar to the version in the Ainulindalë (Silmarillion, ch1), and has always stuck out for me. Why the water? Because it is seamlessly fluid, and so most like the ultimate reality of all things? Or because the sound itself is so intricate and full of clean noise (in the sound design context). After all, the sound of water might be considered close infinite vibrations sounding on infinite particle impacts at infinite angles, whereas the sound of a sharp metal pin hitting a flat metal plate is closer to a single vibration from a single impact. I wonder what this means for Ulmo, Lord of Waters? Does Jung have a water, and an Ulmo? I seem to gravitate toward finding the most significant character in Arda, and there are quite a few. Is it Beren and Luthien, as they represent the last trace of light in the darkest time of Middle Earth? Or Feanor, as the greatest of all the Children of Illuvatar? Or Turin because of his Christ-like suffering and right of meeting Melkor in battle in The End at Dagor Dagorath? Who knows, but at the moment, I am placing my attention on Eärendil. He was the original character that Tolkien began with in The Cottage of Lost Play (History of Middle Earth 1), and represents all bloodlines (Men, Elves, Maiar) that sits at the nexus of the old and new worlds at the end of the First Age. It will be fun to uncover the symbolism of Eärendil and look for traces of this character in other myths. Melkor’s inability to perform true creation is tied to the idea that something of his actual being must pass into the things he “created”, in order to give them an effective substance and reality. Melkor could not create anything, as he did not possess the Flame Imperishable; thus he could only create a mockery of those things in Arda. From his Trolls to the Sun (which was made from a flower from a Tree poisoned by Ungoliant, and was thus itself imperfect), Melkor’s power and essence was poured into Arda. Melkor’s individual self was diminished as a consequence. He was reduced to Morgoth, the “Dark Enemy” (poetically elaborated as “The Black Foe of the World”). Morgoth, once the most powerful being in Eä, spent his will on his vast armies and followers, so that in the War of Wrath, as his armies were swept away before the host of Aman, he was captured by Eönwë and cast off his throne. Morgoth’s spirit was cast out beyond the Walls of Night, yet his presence remains as the pervasive corruption of the world.